Thank you to Cub Scout pack 530 from Vero Beach, Florida for taking the One Million Acts Of Kindness pledge. Girl Scouts, Boy Scouts and children’s groups across the nation are taking part in this lifelong pledge. 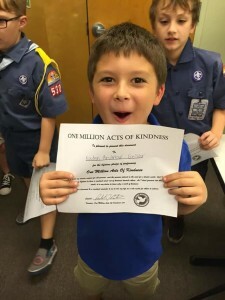 Please feel free to download your personal kindness certificate off of this website. This entry was posted on Tuesday, November 22nd, 2016 at 11:07 am	and is filed under Kindness. You can follow any responses to this entry through the RSS 2.0 feed. You can leave a response, or trackback from your own site.